Double celebrations at BSS House in Swindon, as our longest serving occupant is retiring in the same year that we marks our 30th anniversary. 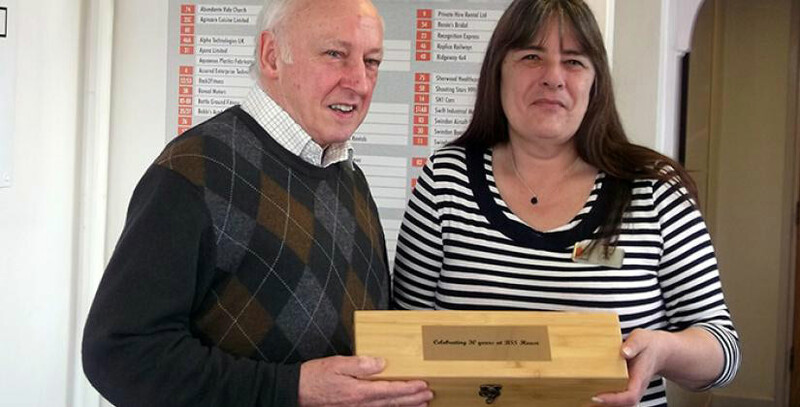 It’s a double celebration at our BSS House in Swindon, as the site’s longest serving occupant is retiring in the same year the business centre marks its 30th anniversary. Earlier this week our Swindon team prepared a special presentation for Chris Rothwell, 71, whose company Thamesair has been based at BSS House since it opened as Swindon’s first business centre. Pneumatic equipment stockist Thamesair has been bought by Oxford-based M F Hydraulics and will continue to operate from BSS House, but Chris is looking forward to a well-earned retirement. Chris says he will miss the work environment of BSS House after he retires on 1st May. “Retirement will be a very dramatic change for me and I will miss the companionship, as well as the intellectual challenge, that comes with running a business,” he says. “I left school at 16 and have been an engineer for more than 50 years. Thamesair began life in 1980 and moved to BSS House shortly afterwards and I have been here since 1990. Chris plans to play plenty of golf after he retires and will begin researching his family history. “One thing everyone will miss about Chris is his singing,” says Jane Kirk, Business Centre Manager. “He would often sing to himself while he was using the photocopier or walking through the centre and it was lovely to hear. We wish him all the best in his retirement and are very pleased that Thamesair will be remaining here at BSS House. “It’s quite a coincidence that our longest-serving occupant is retiring during the business centre’s 30th anniversary year but it does make for a nice double celebration. We are planning some events to mark our pearl anniversary and are hoping to get lots of our customers involved." I am glad that Thamesair will be staying at BSS House as it has become a part of the company’s history and has been a fantastic base for us. Customers find it easy to come and visit with all the on-site parking facilities and we have everything we need here. Thamesair has occupied three different business units during its 30 years at BSS House as the needs of the business have changed and developed. The firm moved into its current 1,800 sq ft workspace in 2011. Over its three decades more than 500 businesses have had their home at BSS House. Currently, 73 businesses are based at the centre, with 13 of these having been residents for more than 10 years. For more information on the offices, workshops, studio space, industrial units and storage units available at BSS House, contact Jane Kirk on 01793 613 456. See more on Swindon's anniversary celebrations!